What is the difference between Half Day City Tour, Saigon By Night Tour & The Night Food Adventure of Saigon Kiss? All of Saigon Kiss Tours is half-day tours, which means all experiences is 3,5 to 4 hours. We have Half Day City Tour that you can choose in the morning (from 8:30am) or in the afternoon (from 1pm or 1:30pm). This day trip goes beyond the tourist attractions and help you feel the local lives, the real one. We will visit different districts of the city, exploring the hidden gems and finish with a meal. You can visit the popular landmarks in District 1 like Saigon Post Office, Cathedral and Independence Palace by our own since it’s popular and close to each other. Understanding that, our day tour offers a more authentic and local experiences. But it can also be customized to fit your references. If you are available at night, here come the nightlife and local food, don’t miss it! If are food lovers, we strongly recommend our Night Food Adventure, which starts from 5:30pm from your hotel and finish after 4 hours. For those who just want to fill your belly a bit street food and explore the local nightlife, Saigon By Night tour (from 6:00pm) will suit you. 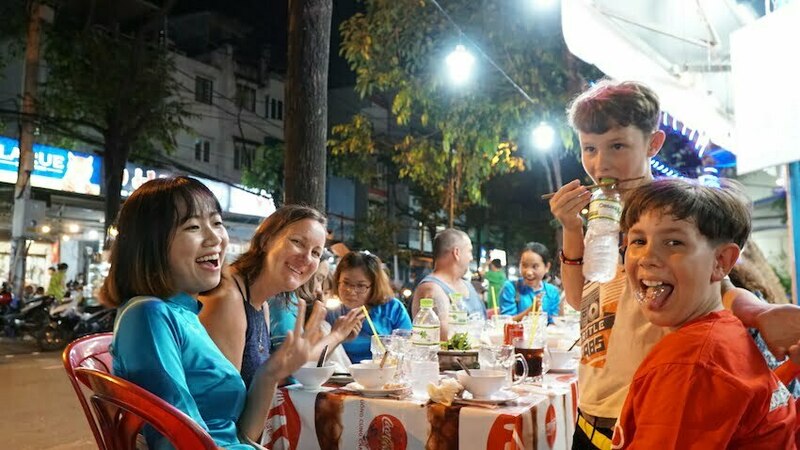 Both tours comes with food & beverages but the Saigon By Night is with street food and the Night Food Adventures is with the variety of local food and food is of course the main theme. Each tour offers something different while the areas that we visit will normally all non-touristy so that you can see and feel how the local lives really is. Half Day City Tour and Night Food Adventure on the same day or different day. This would give you the chance to have two very different experiences of Vietnamese Culture & Food. Half Day City Tour and Saigon By Night Tour to experience the best of the city’s heartbeat. We have many guests who did multiple tours with us and said that they had the best the city can offer within two tours. Is it safe to do the motorbike tour in Vietnam? Can I drive the motorbike by myself? Well, we totally guarantee about that. 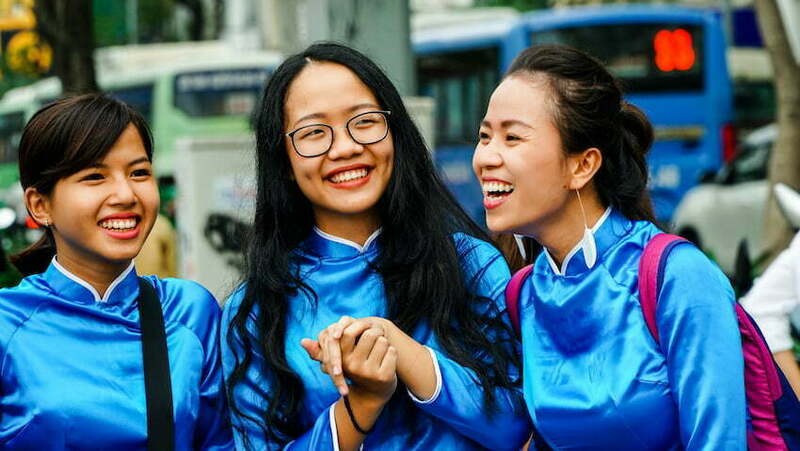 Before working for Saigon Kiss Tours, all of our drivers have to go through an interview, a motorbike driving test then a strict training not only about the tours to make sure all of our girls are trustworthy drivers and great local Vietnamese friends that can be with you during the tour. And sorry that you can not drive the motorbike by yourself. In Saigon Kiss Tours, we have private drivers for you. 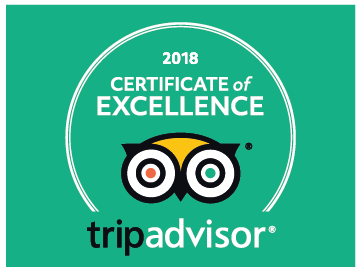 Yes, we have done many tours under the rain before and dear Lord, beyond my expectation, our customers sent us feedbacks that doing the tour with a little rain added new experience they can see the city from totally new perspectives. Saigon Kiss drivers prepare the rain ponchos for you and they are the local experts in giving you the funniest local experience in different weather. We encourage guests to make the most of their time and go out for the fun when traveling. The rain won’t stop us from enjoying the tour, but it’s all about your choice, just let us know in case you can join the tour with us. I travel with my kids. Is Saigon Kiss Motorbike tours kid-friendly? Yes, we have done many tours with kids before. When being notified of the kids, we prepare smaller helmets to fit their heads comfortably and securely. Our drivers are made aware that they will be driving a child ahead of time and we specifically place certain drivers with our children passengers. 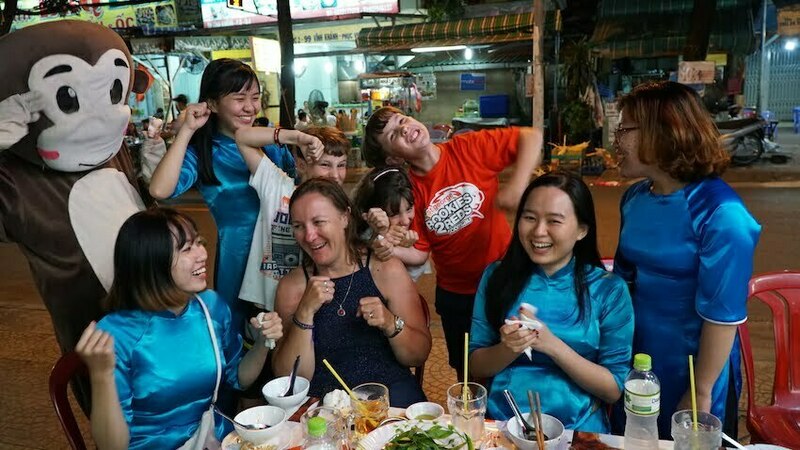 Here in Saigon Kiss Tours, our drivers genuinely love kids. If your child is over 7 years old he will need to ride with a driver by himself because of their size. Otherwise, he sits between you and your driver. The decision is up to you. Just let us know so that we can arrange the number of drivers for your family. I have food allergy / restriction issues. Can I do the Foodie tour? Yes, just notify us before the tour. We are happy to accommodate for you. We provide the Vegan Food Tour and also accommodate food requests like gluten-free, diary-free and Halal food. No one can stop you doing this adventure as it’s fun. But please inform us if you are over 120 Kilo’s so that we can arrange to have one of our drivers who has a larger bike and she will be the strongest girl in our Saigon Kiss team. How to wear appropriately for the tour? Comfortable clothes is perfect for the motorbike adventure. And ladies, we don’t want to upset you but please don’t wear expensive jewelry. A phone or camera that fits your pocket is okay for some photo memories. Why Saigon Kiss? Can we kiss the girls? NO. Saigon Kiss is a slang which literally means a burnt on the lower thigh caused by the hot exhaust of the Vietnamese motorbike. The founder of Saigon Kiss have one Saigon Kiss on her leg and she wants to tell that story and put that into the tour concept. Many Vietnamese have Saigon Kiss too. Yes you can. In the travel planning process, things might go a bit differently which leads to the flight date changed or the unexpected itinerary change. Understanding that, we have choices for guests when booking with us. You can choose to pay in advance with you Paypal or credit card or you can pay in cash later after the tour finish. You don’t need to deposit the tour in advance. But in case you book the tour with Saigon Kiss and want to cancel, just let us know so that we can inform to our drivers. We will appreciate if you cancel the tours at least 3 hours before the departure time. Can you pick up us at our hotel? Yes, on a daily basic your drivers will show up in front of your hotel at the departure time of the tour or your customized time that you notify us. 98% of travelers stay in the city center (District 1, 3, 4) where we can easily offer free hotel pickup. If you stay at hotels in District 2, 5, 7, Binh Thanh or Tan Binh District, a surcharge of 50,000 Dong or US $3 will be counted, directly payable to your drivers after the tour finish. If you stay far away (other provinces like Binh Duong or Nha Be), you can easily take a taxi to the Independence Palace and your drivers will wait for you there then start the tour. Your drivers join the meals with you for a friendly atmosphere, share the stories over dishes and together taste the yummy authentic food. Yes, we are happy to shout out loud that our great performance is recognized with this #Travler’sChoice. Our old guests have turned out to be the best ambassadors for Saigon Kiss Tours when they keep introducing us to their friends. It’s good to look back, understand and embrace the country history of poverty and the endless war. But here each of us also look forward, present a bright image of Vietnam youth on the journey to the global standards.